36 Channels with Up to 26 Mile Range * NOAA Weather/All Hazard with Alert and Weather Scan * 121 Privacy Codes * 5 Call Alerts * 3 Level Vox for Hands Free Operation The Midland LXT600VP3 36 Channel GMRS Radios with NOAA Weather/ All Hazard Alert. Includes Rechargeable Batteries, Dual Desktop Charger, and is packed in pairs. The LXT600VP3 features the standard 22 GMRS Channels with an extra 14 Channels and a range of up to 26 Miles. The Weather Scan feature finds the nearest NOAA broadcast to stay up to date with the latest weather and hazard information. In addition to important weather announcements, All Hazards Alert means the LXT600VP3 will receive other emergency announcements such as Child Abduction (Amber Alert), Nuclear Power Plant warnings, Biological Hazard, Fire, and Landslide Warnings. The LXT600VP3 features a On/Off Knob, 3 Level E Vox for Hands free operation, 121 Privacy Codes, Scan of the 36 Channels, 5 Call Alerts, Keypad Lock, Battery Save Circuit, and is water resistant. 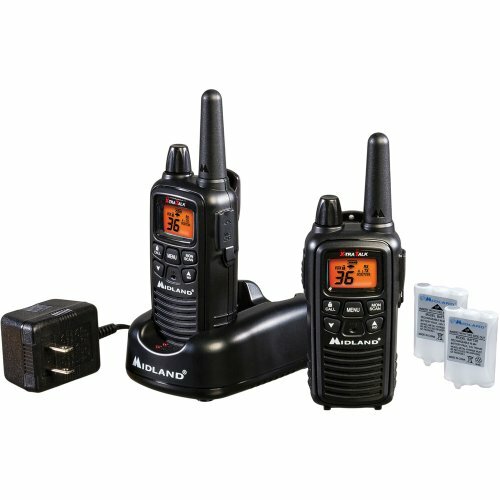 Unlike other GMRS radios on the market that use lithium batteries, Midland's Dual Power Option allows the use of the included rechargeable batteries or 3 "AAA" batteries (Not included). An External Jack can be used for the Midland AVP-1 AVPH1, AVPH2, AVPH3, AVPH4, and AVPH5 Headsets. Paintball/WoodsBall Approved (was 4 stars, but now 5 stars), Nov.. I decided to buy a pair of these.I tried them out 11/03/2012 ref'ing a paintball game on a 2 1/2 acre field (mostly trees - about 10% open space - about .2 miles from one end to the other) with no difficulty on a FRS channel (Channel 9, CTCSS Sub-Channel 11). They also communicated well with my uniden radios.The real test was yesterday (11/17/2012 [...]) when I was be ref'ing a much bigger event on a field that is almost 20 acres (mostly trees - about 5% open space - over 1/2 of a mile from one corner to th.. I originally purchased one pair to stay in contact with my lead man on our shift in a manufacturing facility. Our department is extremely noisy, as we have numerous machines stamping out metal parts, forklifts beeping and driving by. I use the AVPH3 surveillance headset because my job entails that I use both hands working with pneumatic tools to set the dies to stamp the parts. When my Lead calls, I have no trouble hearing him, and answer him with the push-to-talk button clipped to my shirt.After we used t..
J. Evans Jr. "Jim Evans"..
We purchased two pairs of these radios so four of us could stay in touch during a large event on two levels of the Broward County Convention Center in Fort Lauderdale. The radios worked flawlessly. A BIG bonus is that they are small and lightweight. We are buying two more pairs today, for a total of eight radios.We charged for 24 hours before first use, used them all day/12 hours, and batteries are still at full power. We were advised by a Midland rep NOT to leave the radios on the charger as a matter o..
Susan - See all my revi..